Steve Jackson says a video game version of Munchkin, the RPG parody card game, "would be awesome"
If you've ever gone deeper into board and card games than Monopoly and Uno, you've probably heard of Munchkin. The premise is straight-up parody (specifically of people who abuse RPG systems to create overpowered characters) but the 3-to-6 player card game is a massive hit in its own right, spawning dozens of expansion packs and spin-offs like Munchkin Zombies, Munchkin Marvel, and even Munchkin Rick and Morty. But there's still one big place that Munchkin hasn't gone since it first arrived in 2001: your video game system of choice. 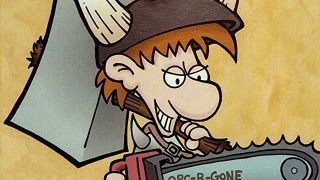 I recently spoke with Munchkin designer Steve Jackson about Ogre, another game of his that's getting a long overdue video game adaptation. Once there was a lull in the tactical tank battle conversation, I had to ask him about what seemed like an incredible oversight. Munchkin is his company's biggest game by a comfortable margin, and sure, there are Munchkin phone apps to help you play. But had he ever thought of doing actual Munchkin video game? "No! It never occurred to me! What an idea!" Jackson shot back, laughing. I got the distinct impression that the idea had in fact occurred to him before. "One of these days I'd love to be doing an interview like that and talking about Munchkin, but nothing I can say right now." Perhaps detecting that I was still reeling from his merciless sarcasm strike, he threw me a bone: "It would be awesome to be able to put that experience online for three, four, five players at a time. That would be great." Earlier in the interview, Jackson had used Munchkin as an example when discussing the right and wrong ways to do a board-to-video game adaptation. "A Munchkin conversion, you wouldn't want to make a point-by-point emulation of the card game, that just wouldn't work," he said. Then again, plenty of card and board games work well as direct video game adaptations. Just look at Magic Duels, Pandemic, or hell, lots of people liked that Xbox 360 Uno game (admittedly, the Chatroulette-style camera feeds helped with that one). I floated that idea by him, too. "Yes, I know what you mean, I've got a couple of games on my tablet that I play once in a while, I have to admit," Jackson said. Suffice it to say that there are several avenues that Munchkin could explore in the non-cardstock space. If you're a big-time Munchkin fan who is eagerly awaiting the day that you can kill monsters and backstab your friends around a tablet or online via your big-screen TV, I'm afraid I can't give you much comfort. But at least you know that the idea is definitely not foreign to Steve Jackson.